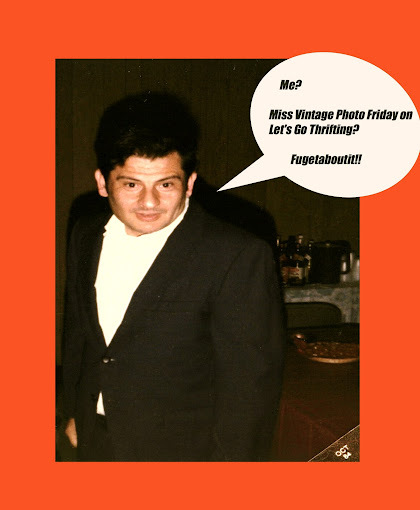 Welcome to Vintage Photo Friday! Go ahead. Make him an offer he can't refuse. Since amassing not one, not two, but three photo albums from Goodwill in the past few months, I've decided to start a virtual tour of my blossoming collection. Each Friday from now until the foreseeable future when I may one day run out of photos to display, I will present you with Vintage Photo Friday, a collection of thrifted wonders to delight the eye and boggle the mind. These personal snapshots, polaroids, group poses and candid moments of people who I never met will long live in our hearts here at Let's Go Thrifting! So sit down and stay for our weekly vintage viewing of visual proof that not only did shoulder pads, pillbox hats and floral frocks exist, but these fashionable folks are wearing them proudly.